Cool off this summer and experience the best in Colorado Ziplining and Arkansas River Whitewater Rafting with this package! Enjoy a beautiful day in Colorado’s Rocky Mountains combined with Whitewater Rafting and Zip Lining, you can enjoy these activities all in one day or on different days. Our Raft-N-Zip Combo Trip offers an exciting experience, rafting Colorado’s famous Browns Canyon in the morning and enjoy jumping in a harness for an afternoon of aerial views of Colorado’s Rocky Mountains as you go zip lining over 7 different sets of cables! Browns Canyon Rafting has partnered with Top of The Rockies and Captain Zipline to offer our guest a complete Colorado Outdoor experience! Soar over a rugged canyon and explore the majestic Rocky Mountains of Colorado. Suspend your fear as you zip along our cables, reaching speeds up to 40 mph, and soar over the canyon floor some 100-200 feet below! Guests come for the adventure, but they get a whole lot more–while taking short hikes between the platforms, they can marvel at the 300 million-year-old colorful rocky cliffs, look down at the 1890 lime kiln ruins and abandoned silver mine shaft, or learn about the area’s rich past, steeped in mining and Wild West history. Highlights of the tour include the Pack Rat Penthouse, petrified travertine spring formations, pinyon pine bonsai tree growing out of solid rock, and the highest point in the tour–the Eagle’s Nest deck–perched 500 ft. above the whitewaters of the Arkansas River. Check out the views of awesome 14,000 ft. mountain peaks from the zipline platforms…after all, this is Colorado Rocky Mountain High at its finest! Book online or call us at 719-295-2890 to reserve your adventure! This is the most popular Colorado white water rafting trip. Browns Canyon offers class III+ whitewater rapids that are perfect for the whole family. When you are planning your next trip to Colorado make sure that rafting Browns Canyon is a part of the adventure. This Colorado white water rafting trip is perfect for first timers and a must see for the experienced rafter. 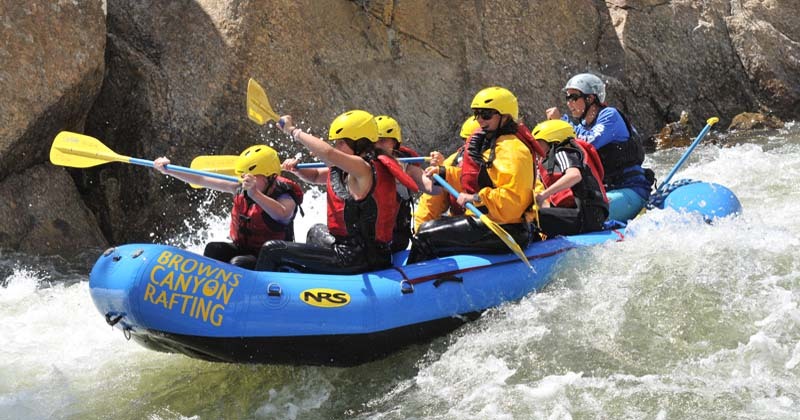 We offer half day, full day and multi-day Colorado whitewater rafting trips through the Browns Canyon section of the Arkansas River, giving you the opportunity to see everything that Browns Canyon has to offer. Remember to keep a sharp eye to spot all of the amazing wildlife in Browns Canyon, look up the canyon walls for a chance to spot bighorn sheep, deer, and possibly even a mountain lion. Remember to ask your guide about taking a cool dip in the river on those hot summer day. If you are interested in boating this section, we recommend that you are are prepared for a wet and thrilling ride! The Numbers section of the Arkansas River offer some of the greatest white water rafting in Colorado and in the country! This Buena Vista white water rafting trip will show you the meaning of excitement. Experience continuous class IV+ rapids that are sure to provide a heart pounding and adrenaline pumping adventure. If you’re looking for big drops, splashes and non-stop action then this is the rafting trip for you. Pay close attention your expert guide as he instructs and maneuvers the raft with the help of your paddles through the steep drops and narrow channels. Be sure to check out the majestic views as well! Like all Arkansas river rafting, the scenery is not to be missed.